Despite its serious and complex topic, Practice Like This is easy to read, always friendly and sometimes funny. Most topics are covered in a page or less. Striking visuals have been carefully chosen or created to help the concepts stick in your head. Check out some of the images in the slideshow below. 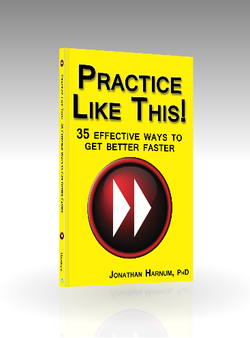 Learn the 3 kinds of practice and how your brain is rewired when you learn new skills. Your deepest, unspoken beliefs profoundly affect your motivation to improve, ya filthy animal. This section is about you and the others around you who help (or hinder) how fast you get better. Learn why your reaction to difficulty matters, and why teachers, coaches, parents, and peers matter just as much. Time of day, how long, and how practice changes over time. Forget the 10,000-hour rule. Practice time isn’t what you’ve been led to believe, nor is it otherwise. Part 5 - Where You At? Where you practice and who you’re with will affect how fast and how much you improve. What can you do about it? Part 6 - Do it To it! The longest section of the book. Learn some of the best practice strategies and techniques: used by pros, tested by science! I've licensed the images below under a Creative Commons Attribution-NonCommercial-ShareAlike 3.0 Unported License.